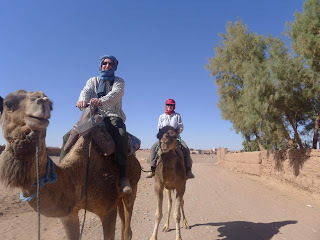 As we are on the edge of the Sahara, we thought we should do the obligatory Camel Trek. If there is a more uncomfortable way to travel, I don’t know of it. Those damn animals should come with an OHS warning. The saddles are clearly made of concrete, cleverly disguised with a blanket for the unwary tourist. My arse was screaming within 10 minutes, but I bravely soldiered on. The guide, who was sensibly on foot, kept turning around and saying Ca Va? Bien? We grinned back Ca va!! After 30 minutes of this torture, he’d call out “CaVa?” and not knowing how to say “no, you jerk, my arse is killing me” in French, I’d groan “Ca Va!”. Lawrence and I made the decision that we could not possibly endure 3 hours of this torture but held on until we got the sand dunes. “No more” we cried and dismounted with very little dignity. 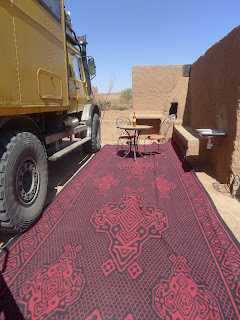 We were led into a mud hut for mint tea, which cruelly had small hard uncomfortable stools to sit on but even they felt like velvet compared to a camel. 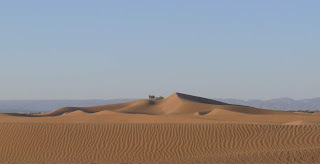 We walked the hour back to the campsite with the camels looking well pleased with themselves for having got rid of us. Large stiff gins were required. I’m sure we’ll have a good laugh about this one day – when the skin grows back. The campsite however is quite lovely. 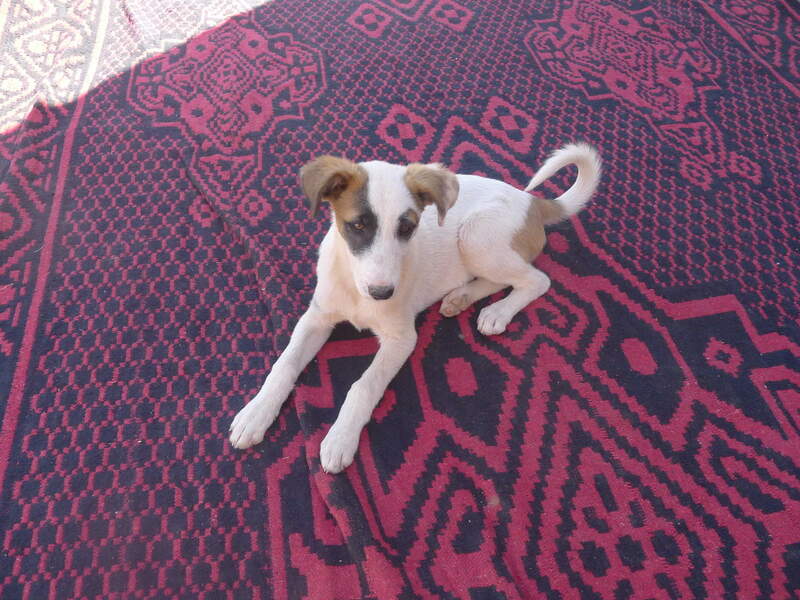 We have our own little mud brick courtyard, furnished with a large rug and some outdoor furniture, we even have our own dog, a small puppy who came to visit when our lunch was delivered. 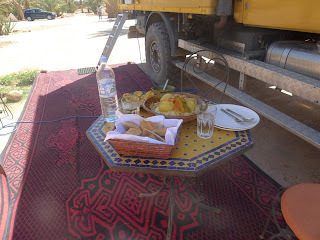 The home/mog delivery service at Moroccan campsites is going to be the thing we miss most about this country. The air here is so dry that when I put any kind of moisturiser on, my skin makes loud sucking noises. The days are still warm and sunny, getting hotter, nights are still cool. The town, M’Hamid is a scrappy little affair, with little to recommend it other than access to the pre-Sahara and a Nomad Festival. We could hear the music last night but just didn’t have the heart to leave our wine glasses and stagger into town after our camel experience. Interestingly we could hear the distinctive haunting sound of the didgeridoo – we might go in tonight, if they can get the power supply sorted. This is the furthest south that we’ll venture. We are at 29º 49.2 N and 5º 43.2 W (for the geeks) and so far have travelled a total of 4,813 kms – which is a bit pathetic when you consider we’ve been on the road since September 26. We did 4,500kms in 10 days when we went out to Lake Eyre. We’ll probably head north tomorrow and back over the High Atlas via some interesting roads that Lawrence has been researching. I hope my backside it up to it by then. Love your work as always Katie Kate. Natalie and I are really enjoying the blog. I am sure you would have loved your chiropractor after "The Bloody Camels"!